Quick release butterfly buckle closure design can make your Fitbit Alta watch looks more delicate personality. 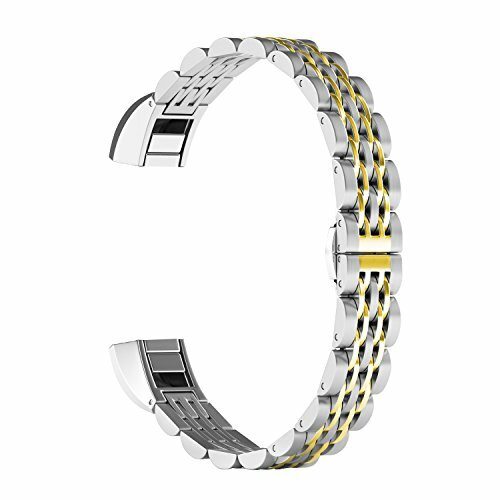 Classic styling of metal watch band suits most occasions in life, from casual to formal. Eco-friendly, low-key, elegant and practical. Best gift for yourself , your family or friends! Please feel free to contact us if you have any questions or concerns. We will try our best to solve your problem. Flexible Design: The length can be adjusted with the link removel tool (included) it according to the circumstance of individual wrist, securely and convenient to put on or take off it. Fit for wrist size:5.5inch~8.9inch. Unique Butterfly Folding Clasp: Adopt double button butterfly clasp, firmly closed, and prevent loosen automatically, safe and beautiful. Warranty & Package: 100% money back guarantee if the Fitbit Alta Band doesn't fit or meet all of your expectations.Package included: 1x Watch Strap, 2x Spring Bars, 1x Link Removal Tool. If you have any questions about this product by ImmSss, contact us by completing and submitting the form below. If you are looking for a specif part number, please include it with your message.